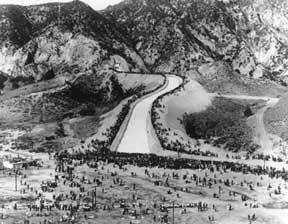 November 5, 1913: First Los Angeles Aqueduct is dedicated. “A carnival atmosphere prevailed for the dedication ceremonies at the “Cascades” on November 5, 1913. The San Fernando Valley Chamber of Commerce distributed bottles of Owens River water to the 30,000 celebrants who arrived by car, wagon, and buggy. The Southern Pacific charged $1 for a round trip ticket from Los Angeles to the site of the San Fernando Reservoir near Newhall. Pennants proclaiming the event sold for 10 cents. This entry was posted in Year 6 TDIWH and tagged Croton water supply, drinking water, Los Angeles, Los Angeles Aqueduct, water, water history, water waste, William Mulholland on November 5, 2017 by safedrinkingwaterdotcom. This entry was posted in Year 5 TDIWH and tagged Croton water supply, drinking water, Los Angeles, Los Angeles Aqueduct, water, water history, water waste, William Mulholland on November 5, 2016 by safedrinkingwaterdotcom. This entry was posted in Year 4 TDIWH and tagged Croton water supply, drinking water, Los Angeles, Los Angeles Aqueduct, water, water history, water waste, William Mulholland on November 5, 2015 by safedrinkingwaterdotcom. 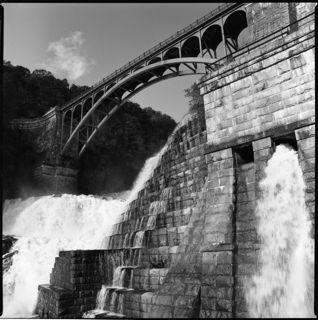 This entry was posted in Year 3 TDIWH and tagged Croton water supply, drinking water, Los Angeles, Los Angeles Aqueduct, water, water history, water waste, William Mulholland on November 5, 2014 by safedrinkingwaterdotcom. He paused for a moment as if contemplating his words. The satisfied, he abruptly said, “That’s all,” and returned to his seat amid a tremendous roar from the crowd…. 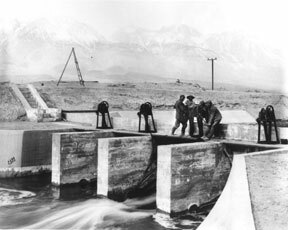 This entry was posted in Year 2 This Day in Water History and tagged Croton water supply, drinking water, Los Angeles, Los Angeles Aqueduct, water, water history, water waste, William Mulholland on November 4, 2013 by safedrinkingwaterdotcom.